Resort Sitters is the premier resort area babysitting referral service across Colorado and Utah. We provide excellent child care for families, groups and events. Our experienced and reliable sitters come to you. Your children, your location, your schedule. The company has been in business since 1998 and operating under the name Resort Sitters since 2001. 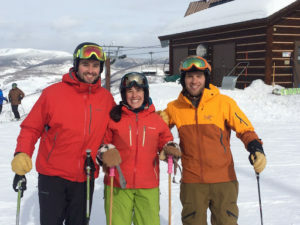 Resort Sitters is owned by siblings Liz and Tim McCabe along with longtime friend Rob Vitulano. All three of us were born, raised, and taught to ski in New England. We are proud alumni of Fairfield University in Connecticut – Go Stags! Liz spends her winters teaching children how to ski as a Level II certified instructor, and her summers teaching women’s and children’s golf. She is passionate about providing superb customer service. Liz has also been a sitter for the agency since moving to the Vail Valley in 2010. Her favorite activities include skiing, golfing, hiking, being outdoors, and backcountry commuting home via the Minturn Mile! Tim is a true weekend warrior – working weekdays as a financial analyst for a small investment manager. He is a CFA charterholder and an advocate for both impact investing and global sustainability. Tim enjoys all things outdoors and is always searching for the next adventure with his wife, Catherine. His favorite vacation memory is shared with Rob, when they checked off a bucket list item: heli-skiing Zone 8 in Silverton, Colorado! Rob enjoys spending time on the mountain, regardless of the season. He is an avid skier who frequently travels to destination resorts, but has the most fun watching his young nieces take their first turns. When the snow melts, Rob plans an annual backpacking trip to a different national park every Labor Day Weekend. During the week, Rob works at a tech company that builds software for better customer relationships. In late 2016 we coupled our entrepreneurial spirits with our appreciation for client service when purchasing Resort Sitters. To us, this company represents a perfect opportunity for providing an integral service for both vacationers and natives of the great Rocky Mountains! Feel free to drop us a line by visiting the Contact Us page. Let us personally select and reserve your babysitter now!